By far overpriced, it will cost you an arm and a leg in the long run, don't be fooled by the good review. Mine was sent a few times for repairs, while in USA it was returned to me with new board new coil and headphone. I used one or two months and then stored away in my wardrobe. Last year I used again for a month and it broke down. I sent in UK to a mainlab dealer for repair, only to be told that it was too old and unable to repair. It returned to me with a pair of old used headphones and peeled cable coil and headphone. Not like I send it to them for repair. I recommend to anyone to keep well away from doggy dealers repairs and minelab, most of all aways from useless Excalibur that breaks down a lot. I bought my Excalibur 1000 in 2004, it has done me well on land (I have never dived with it) but recently started making a continuous noise without changing tone over metal objects, so not detecting at all. I thought it must be the age of the battery and bought two more (excaliburII batteries), one capable of diving which fits the Excalibur1000, one just a case for AA batteries which does not quite screw properly but provides power). After fitting these AA batteries in the new pack I found the detector was still doing the same thing. You may get a good machine or you may not! About 1/2 of the people I know with Excaliburs had to send them back to Minelab because it was broken after a month or it flooded. The other 1/2 love it. So it's a coin toss. I unfortunately had a bad machine, flooded after a few dives with it. I wouldn't buy another one because of its design. Too many knobs to break. Too many seals to leak and NOT worth $1,400! Looking at other machines for this summers dives. 1. All-metal will go deeper than Discrimination (about 3") in wet sand, so I only use All-metal. Often, I will switch to Disc. To check a target IF it is not too deep to detect on Disc.. If it is too deep to check on Disc., I'll dig it up because very deep mixed-metal targets may cancel and appear to be ferrous metal/junk. 2. It will take about 40hrs of actual use to discriminate the different sounds. 3. A fully charged unit lasts about 13 hrs. Charge the battery for 2x use time, for example, if you use your fully charged unit for 4 hrs then charge it for 8 hrs. The battery will run down if you charge it on a 1:1 schedule. Do not overcharge the battery as this will shorten battery life. 1. The balance of the Excalibur is very poor and you should buy an Anderson straight shaft or extension to mount the control unit and battery pack behind the elbow. 2. The battery charger that comes with the Excalibur is very poor. Be sure NOT to bend the wire where it comes out of the charger, as this will cause charger failure and a possible fire. You should discharge the battery fully and recharge the battery fully at least a few times per yr to keep it charging well. There is an aftermarket charger and battery pack available to provide a faster and longer lasting charge - buy it when the original battery pack dies. 3. Buy a knob guard. The last thing you want to do is drop the unit, which I do all the time, and bend/break the control knobs. 4. Wrap the wires with plastic ties around the shaft to minimize wire movement, especially in the surf where wire movements can cause noise or false signals. DO NOT bend any wires where they enter/exit for the control unit or battery pack as this will eventually lead to water leakage and unit failure. 5. Buy Silicon grease from a plumbing supply store and use it regularly on the seals. 6. Wash the unit with fresh water after each use. Also, remove the skid plate and wash the sand away from the coil as this sand will wear the coil and lead to coil failure. A, knob are worthless, feel off or broken after a week of use and knobs labels and numbers are meant really nothing (not working as what it says on their label and manuals). B, After a couple of used it make constant noise when turn it on even you disconnect the 10" disc from the handle still making constant noise which drives me crazy. I don't recommend this machine to anyone, it is not worth the price $1000 plus price tags. 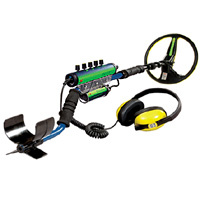 Excalibur II 1000 Metal Detector worth only $12 of design and engineering. JUNK! I don't know where and how the folks that are only getting six inches or less on a quarter are hunting but I will have to strongly disagree with that assessment. Since I have dug dimes at about twice that depth and quarters even deeper than that on the beach. The one thing that I detest about the Excalibur II is the lousy headphones that Minelab puts on the machine that is now retailing for $1500.00. I own the Sovereign Gt which is the cousin of the Excalibur II. The tones are much clearer and cleaner with the GT and Quality headphones when compared to the headphones on the Excal. Battery compartment leaked on first dive! Poor quality. I use a sov gt on the beach which is basically the same machine as the excal. Only difference is the waterproofing on the excal which is a big bonus. I will probably invest in a fully waterproof design in the near future whether it is an excal or a pi unit as most of my detecting is now beach based. What this post is about is the threshold on both the excal and the sovereign. I've read here that people are ignoring targets that null out the threshold. Be careful. If your threshold nulls and returns as the same tone it is worth scraping away a few inches of sand and re checking the signal. You may now get a good target signal. Sometimes the threshold will null on very deep signals and it is not always iron. I read this in the manual and ignored it for ages but thought I would try it and found that some iron nulls can in fact be targets that are on the very edge of the detectors depth capabilities and won't give a good target signal. The majority of signals will probably be iron but some won't so it is worth the effort to remove a spadefull of sand and re check the signal. The Australian made original Excalibur with red or green headphones is still considered better than anything out there. The original price was $1123.60 after 1998 taxes in Florida. BBS technology is no joke. This machine will detect tiny specs of metal in sand so be aware of the fact that 17 frequencies vs 1-3 with the cheap/lacking technology machines is a big difference. Don't believe all the reviews you read because there is people out there trying to sell you on other products I believe. I am currently refurbishing my Excalibur to todays standards with a belt for the board and controls, a carbon fiber shaft, a lithium ion battery with 11.1 volts and 1600mah (12. 6v when fully charged) and thats it. Cons: The battery case on mine is cracked on the sealed end cap and I heard this is a common issue. I read on the internet "there is no replacement... the newer Excalibur (II,1000 and 800)battery case does not fit. Tips: I drizzled some waterproof Gorilla glue on the bottom of the case and let it sit upright so that it would evenly coat the bottom and reseal everything up. You may want to buy a clear or white waterproof glue though, the Gorilla glue is dark yellow/light brown color. -Keep all rubber rings oiled up with olive oil or that silicone grease stuff. -Wash your machine completely with fresh water after use in salt water, it will rust so don't take what I'm saying with a grain of salt. -There is a manual that you can view on Minelab's website, just search in the archive section for this machine.